After much stewing and being angry, this shirt finally got finished. Its a mixed bag. The pin tucks look nice and allow for a blousy effect. The shoulders and body of the shirt fit really well and are very comfortable. I made the elastic in the cuffs too small, so its not really very comfortable to wear with the sleeves scrunched up. I had to hem it twice to get the length right and I’m not sure I love the length yet. The collar.. . URGH! It is completely not right. Since I had messed with the width of the neck, I didn’t want to just cut the collar stand straight from the pattern. In my infinite wisdom, I thought, “Eh, I’ll just make it using bias tape.” Its super wonky and lays all wrong, and I really really should have just laid the neck out and drafted a new collar stand. I didn’t know how to do that at the time. I learned how to later and haven’t had the patience to rip it out and re do it. But that is exactly what needs done. The placket: I didn’t sew it very well so part of the raw edge sticks out on the front near the hem. I just zig zagged over it with a short stitch in black thread. I’m sure no one else would ever notice it. I added a lot of width to the sleeves to make them flowy and blousy, and that turned out alright, but I should have added a good 3-4 inches in length. Most of everything that I don’t like about it was my fault, stemming from inexperience. I finished this months ago, so thankfully I have moved on and learned from my mistakes. Well friends and neighbors, it’s day 2 of Me Made March! Woot! So far, so good. I have suddenly realized that I haven’t made that many clothes, and am VERY glad I included refashioned clothes in my pledge. News A: I finished marking and cutting out the Yellow sheet princess seam button down… (it needs a name, I’m going to call it my Joyce shirt.) I basted my first princess seam together! Yay! It wasn’t as terrifying as I expected. Probably because I hand basted it and nothing can be scary when hand basting. In the big 2 gallon ziptop on the left is the leftover scraps and pieces of the fabric. Inside that bag go the two smaller bags, one with the tissue pattern pieces & instructions, the other with the cut and marked fabric pieces. News B: I found that dang pin tuck shirt. I suppose I’m going to have to finish it now. Yippee Skippeee. News C: I’ve started a tunic. 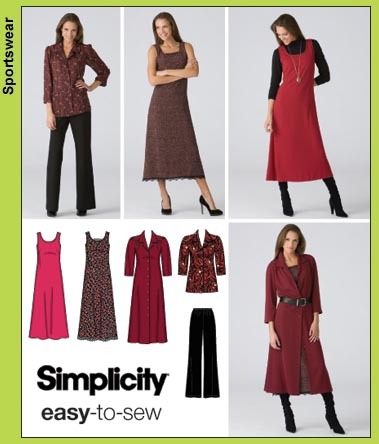 Its Simplicity 4149. I’m calling it the Annie Tunic because my friend Annie once wore a shirt very similar to it, when I was just learning how to sew in 2008 or 09 and it is the inspiration behind it. I’m making it out of a crinkly black gauzy cotton. It looks like it should be pretty quick to put together once it’s cut. News D:I got my point and shoot digital camera back from being repaired today! Yay! News E: I drafted a new skirt pattern. Its a pretty simple A line skirt, but I had to complicate it with trouser style pockets, a waistband, and a front full length button closure. To be honest, its a knock off of Colette’s Beignet skirt. I am SO pro-small business, especially sewing businesses, and I try to support them whenever I can. 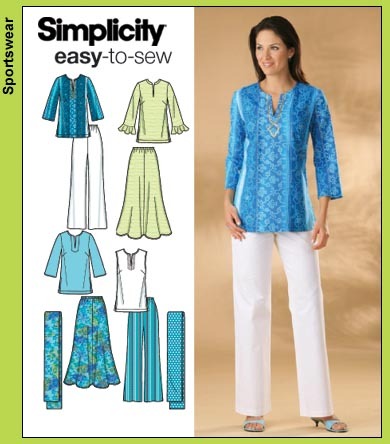 BUT the fact is, the pattern is not available in my size, and I wouldn’t look good in that pattern as it is, so I’d have to do some major overhaul to wear it. Its easier for me to just draft a similar skirt myself. Hopefully I’ll get the Annie shirt or the dang pin tuck shirt done soon. Ooh or maybe the charcoal skirt…! Happy Wednesday! Why is it that it’s never around when you need it? I have a boat load of sewing to get done between now and tomorrow evening at 6. Have I sewn anything at all since I got done with school on Saturday evening? Nope! I organized my sewing area though! That’s something. There are more presents that need to be made. But they either aren’t photographed or can’t be put online just yet. Here’s hoping my mojo returns!